Mainstream marks another success for Galway students. CHOOSING the right school to send your child to is a daunting decision – but for the parents of a child with Down Syndrome, choosing between mainstream and special schools can be extremely stressful. As a result, Down Syndrome Ireland’s Galway Branch has piloted a new education programme that aims to make mainstream secondary education a real option for these families. And because of the support provided by the group, five children with Down Syndrome have this week started in five main-stream post-primary schools across Galway City and County. One of the five making the move is Ciara McStay, who, on Tuesday last, had her first day at Coláiste Bhaile Chláir in Claregalway. 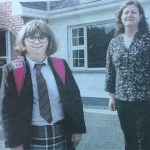 According to Ciara’s mother, Evelyn Fanning, it was always their hope and Ciara’s wish that she would go to the local secondary school – having been a pupil at Claregalway National School for the past eight years. But it was only with the support of the Down Syndrome Ireland initiative that they found reassurance. 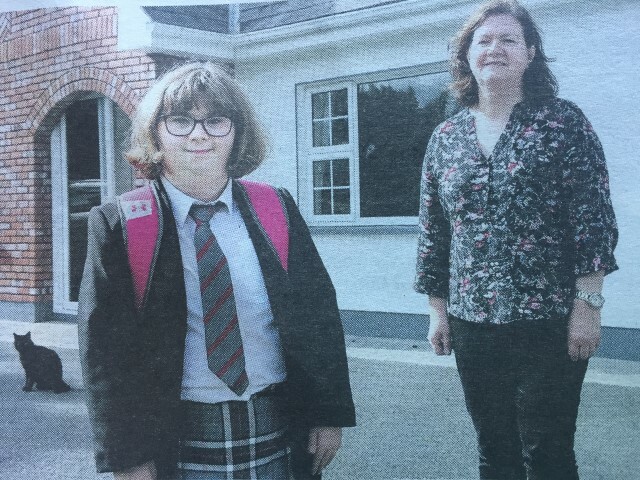 “Really, there were three options – one was for Ciara to attend a special school, one would be to attend a special class in a mainstream school and the other was to enrol as a mainstream student in the secondary school. “It’s really about each family doing what is right for them and all of these being real options – being able to do what is in your child’s best interest and that you will be supported in whatever road you go down. “We feel that this is the right decision for us because Ciara has always been very sociable and would have been a full member of the school community. “In Ciara’s head, she was always going to the local secondary school because her brother, Thomas, would be a fifth year student there,” said Evelyn. She said that without the support of the local branch of Down Syndrome Ireland, they would not have had the clarity surrounding the supports and resources available to them – and so would not have been able to make an informed decision about the best option for their daughter. Down Syndrome Ireland’s Regional Resource Officer in Galway, Irene Walsh, said that they carried out a survey that found around 60 per cent of Galway parents of a child with Down Syndrome wished to see their child go to mainstream post-primary school – but with just six per cent making that transition, it was decided to roll out this pilot scheme. “Parents didn’t feel that there was enough information for them and they felt there were very few people going to mainstream schools. “But we have had two students do the Leaving Cert in Galway this year and we wanted people to know that there is no reason they can’t do this,” said Irene. Evelyn also believed that having students with Down Syndrome in the classroom would only serve to enrich everybody’s understanding of diversity and disability,” she said. And like any parent, she’s nervous seeing her daughter off to her new school – but, of course, Ciara is taking it all in her stride. “She’s delighted – she’s looking forward to doing science and home economics and art – she did Irish in primary school and she enjoys conversational Irish and she’s very much looking forward to it all,” said Evelyn.